Very recently I was driving through a supermarket’s enormous loading dock area, located in the rear of the store, on my way to the even more enormous customer parking lot out front. 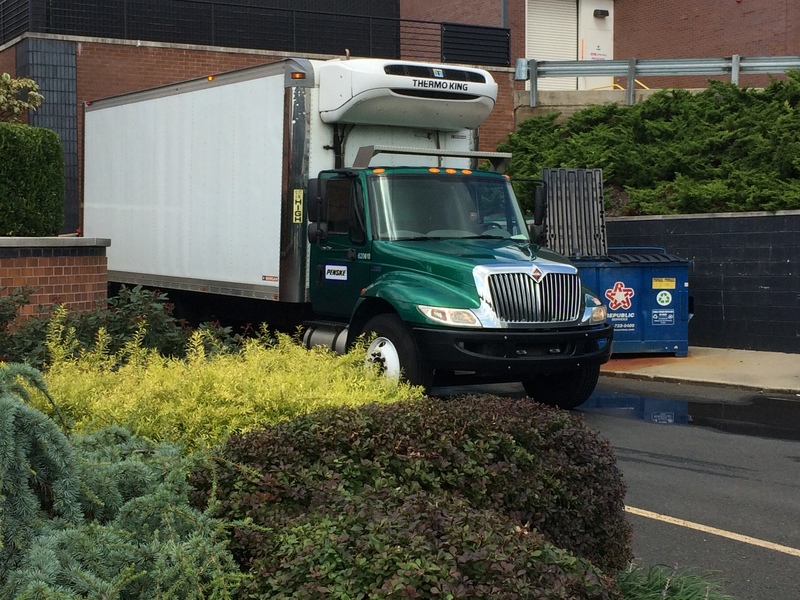 Near the loading docks was a small truck, part of the Amoroso’s Baking Company fleet, delivering rolls to the market. Amoroso’s rolls are legendary in the greater Philadelphia region. Well, I knew I should have stopped to snap a picture of the truck, because its exterior sides were canvases smashingly designed and painted. Rolls and logos never looked so good. But I didn’t. However, those brief moments in the truck’s presence popped an idea into my head. It wasn’t a world-class idea, but few of mine are. And so I’ve run with it. The idea? 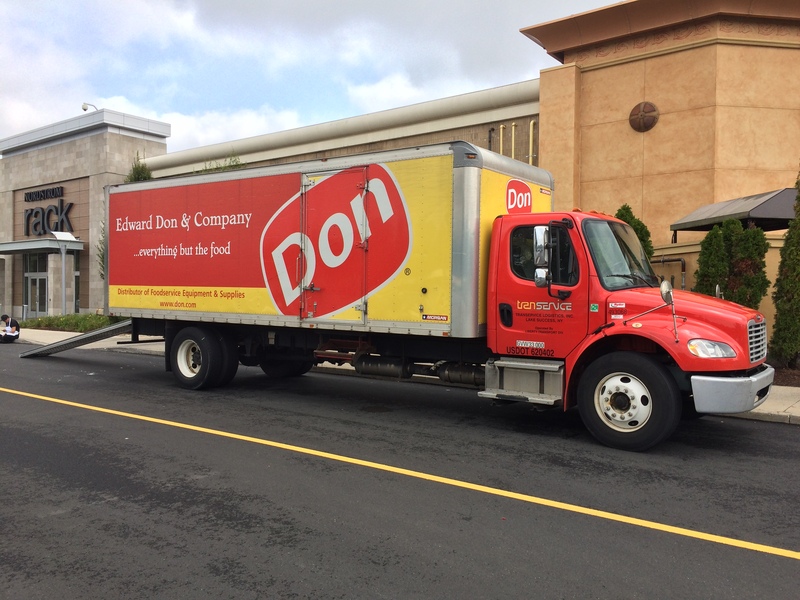 To locate great-looking trucks (and vans, as it turned out) whose images would grace and anchor a story I’d write about seeking and finding beauty in the paved-over and ultra-developed land that comprises my suburban Philadelphia surroundings. I’ve whined a bunch of times before on these pages about the anywhere-USA look of much of where I live. Around here, indoor malls, strip malls, gas stations and office parks rule. But amid all these many eyesores, I realized after ogling the Amoroso’s truck, were works of art on wheels. But how to scout them out? Swiveling my head to watch them as I zipped along the road at 30 or more miles per hour didn’t seem like a game plan to follow. I drive distractedly enough as it is. The solution of course was to troll, while in my car, shopping places’ parking and delivery areas. Which is what I did two Fridays ago, sticking within three miles of my abode and devoting two hours to the enterprise. I came upon some gems. It’s awfully possible that nobody anywhere ever has been on this mission before. If so, I beam broadly. At last I may qualify for admission into some Hall Of Fame or other. In addition to trucks and vans, I also discovered during my excursion that the local police have telepathic powers. Twice, I say twice, I was pulled over, while en route from one shopping province to another, and ticketed for driving with idiotic intent. When I receive the official summonses, I’m going to represent myself in court. Most commercial trucks and vans, as we know, are vanilla, being unadorned or uninspiringly painted. But some are cool as can be, decorated with fine designs and pictures, and with colors that rock or calm, depending on the business’s targeted audience. Andy Warhol probably loved looking at boffo trucks on Manhattan’s streets. That would have been expected of he who delighted in the sight of snappy Brillo boxes. In addition to the beauties and one example of vanilla, I’ve placed an image of somewhat-cute vanilla into this story. 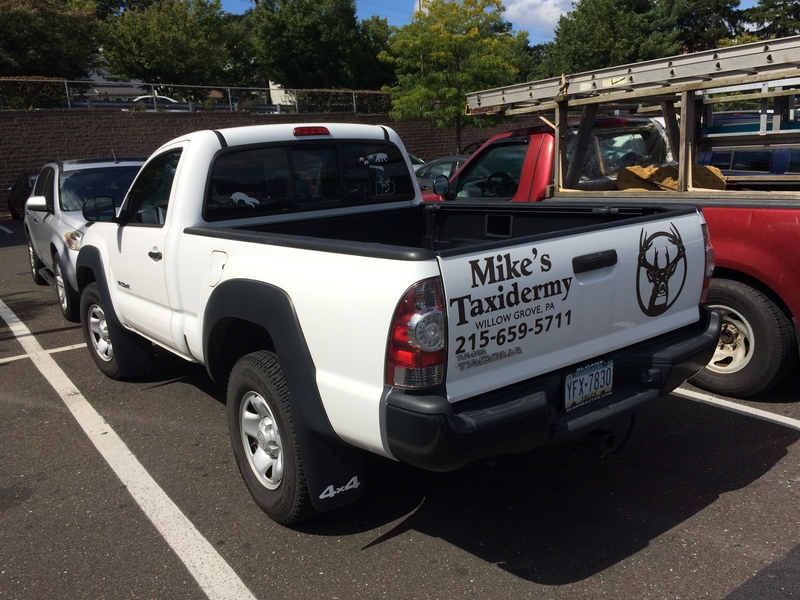 It is the vehicle belonging to Mike’s Taxidermy. I don’t know why Mike didn’t paint some examples of his craft on his truck. He should have. I won’t hold that against him, though. In fact, when my pet groundhog Dig-Dig eventually expires I plan to have Mike stuff and preserve him. I then will sit Dig-Dig in the middle of my backyard so that my memories of him never fade from my mind. In closing, let me say that I find it a tough call as to which truck or van grabbed me the most. Was it the van belonging to Lee’s Hoagie Shop? That hoagie on its roof clearly is rad. 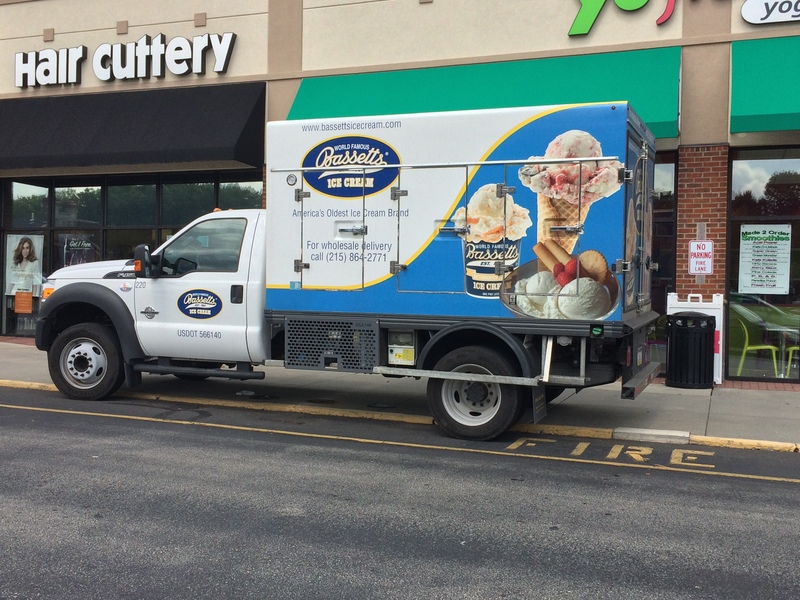 Or the truck delivering Bassett’s ice cream? Man, those scoops of ice cream are tantalizing. Or the Kreider Farms vehicle? It’s a true looker. A decision is required and is at hand. My vote goes to Kreider Farms. I am in love with the pink sky and soft yellow rising sun. And I admire the perfect balance of the design elements. Whoever created the picture is one talented artist. And she/he possesses a good sense of humor and a good heart too. Look at that cow! Talk about adorable. Folks, that’s about it. Thanks for reading. And be sure to check out those fine trucks and vans out there in your neck of the woods. They’re everywhere! Some fine works of art on trucks there. It was fun checking them out. Great trucks. Sounds like you had a fun time photographing them. I really like the Bassets ice cream one and the pea pod giant because they look like vintage advertising photos where food was impossibly perfect and ice cream was so enticing. The cow one is also very cute and remind me of children’s book illustrations. There’s a company in the USA called W B Mason. Their trucks are beautiful. One passed me on the road, but I wasn’t able to photograph it. That was fun. I also liked the ice cream truck as well. Not to forget that Bassett’s ice cream is delicious! What a lovely idea. Thank you for sharing your impressions. I’m glad you liked this piece, Tanja. Thanks for letting me know. 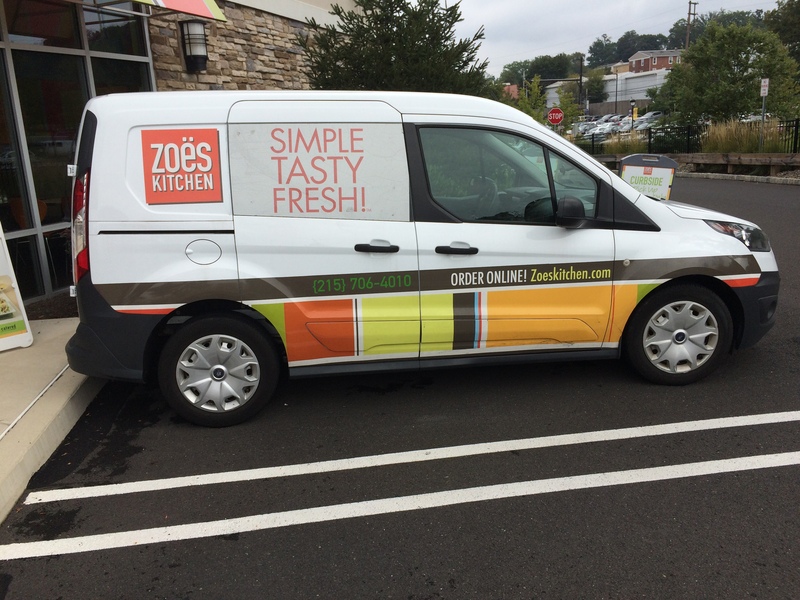 What a great idea for a story as none of us probably take too much notice of the designs emblazoned on the sides of delivery trucks – yet we obviously should. My favourite of yours is also the Kreider Farms lorry, just because that cow really is a bit of a looker and who wouldn’t want to live in a world that had pink skies! You know, I’m not sure if I had ever heard of Kreider before. I’ll have to start looking for their dairy products. If their products are as good as the artwork on their lorries, you’re in for a treat! I agree, the Kreider truck is stunning. I like the way the charming pink sky lightens as it hugs the rolling green hills, and the yellow orb of sun rises next to the fuchsia barn and silo. And the cow’s pink udders seem to whisper “Hey… over here… can I get a hand?” Seriously though, if you’re a pop-art aficionado, this sounds like fun. Neil, I’m looking forward to retirement! Pete, we can go out in search of trucks together! I am 100% behind the cow as my favorite. Now wouldn’t it have been awesome to catch the cow truck parked back to back with the ice cream truck…serendipity for sure! Sometimes things do work out that way. Deb, I appreciate your stopping by. Lee’s makes good hoagies. I haven’t had one there in a while. It’s time to rectify that. It looks as if I’m the only one who calls a truck a lorry around here – Different words for the same thing on opposite sides of the pond. I like the sound of “lorry” more than that of “truck”. You’re the man! No ‘Oscar Mayer Weinermobile ‘ sighting? That would have been cool! We have some pretty funky Food Trucks (Vendors on wheels) up here Painted and decked out like the old Magic Bus thing. Great food also. You’d love it Neil. Good eye, Neil! I just googled “ads on trucks” and saw a lot of photos of artistic (and very clever) advertising on trucks. Now I’ll be looking out for them, too! Hello Julie. Glad you liked it. Thanks a lot for dropping by. My late brother did this exact type of commercial art for many years in Omaha. He helped design and configure the decals and screen printing templates for vehicle graphics on vans, trucks, cars, and city buses. He greatly enjoyed his job. His talents meshed with his career. It’s good when that happens. 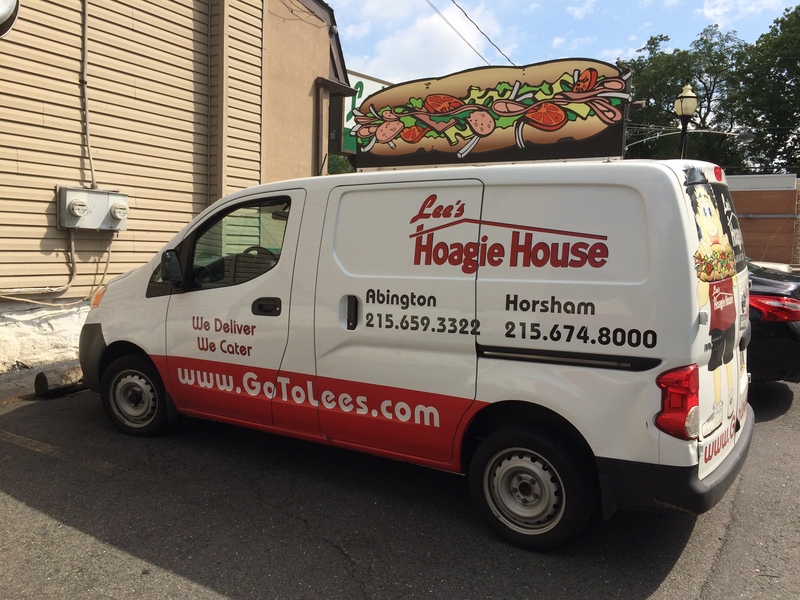 These photos have made me very hungry, especially Lee’s Hoagie House van. Have a hoagie for lunch today or tomorrow. Thanks for stopping by my little corner of the universe. I appreciate it. Neil, that’s such a great concept I may steal it for a Scottish version. Pea Pod Giant gets my vote by the way! 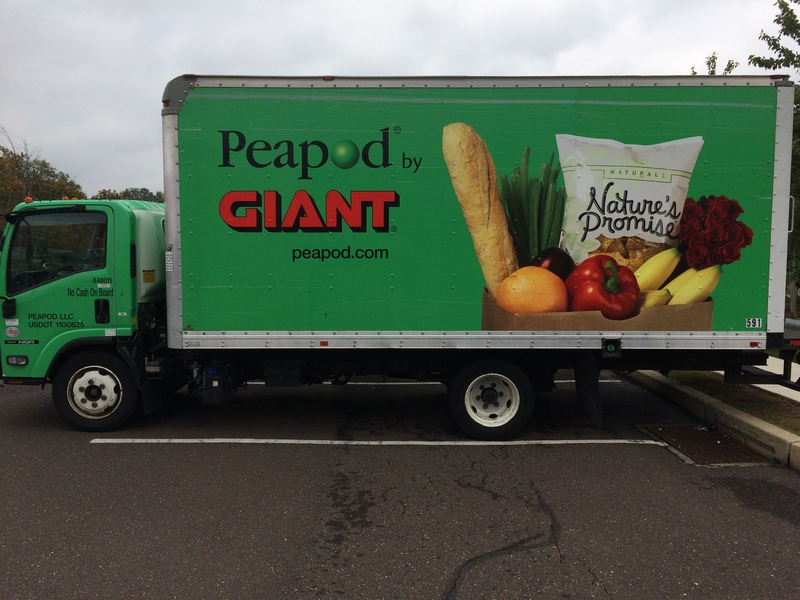 The peapod trucks are delivery trucks for the Giant chain of supermarkets. People order groceries online and peapod brings the order to their homes. Apparently a lot of people are doing this. Driving with idiotic intent?! Oh dear, that describes most of my days. I like the Kreider’s Farm truck best, not that you asked. So you plan to have Dig-Dig stuffed, hunh? Interesting. I absolutely swear on my mother’s grave that the following is true: When I was moonlighting in a thrift store job one summer from my normal job at the local high school, there was a woman who would come in to shop with the oldest rattiest-looking miniature poodle I’d ever seen. She carried it everywhere or put it in her shopping cart. Fast forward two years, and I saw the same woman get out of her car at a CVS, and that dog had been stuffed and was in the back window of her car.–Absolutely true and absolutely gross! Take it from me, don’t have Dig-Dig stuffed. It’s not nice to stuff your pets! A world-class idea 🙂 don’t let the judge get a word in. I love that someone else gets crazy artistic obsessions too!! Made me laugh! Maybe I’ll do a Part Two one of these days. There’s a lot of good-looking trucks out there! Glad to learn that I’m not the only one who admires good-looking trucks! I admire your ability to find beauty in the paved-over commercial world and share it with a chuckle. 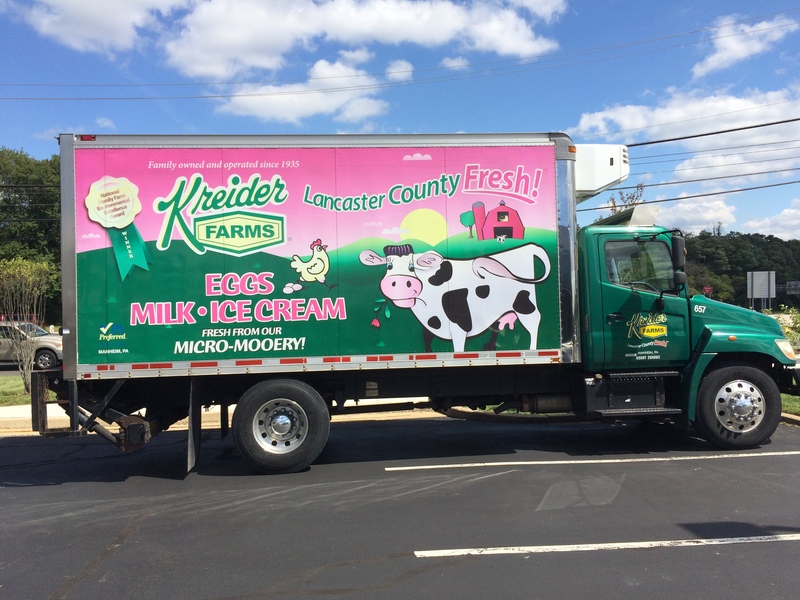 On the whole, the Kreider Farms truck is my favorite too. Pink and green are a great combination that is not seen all that often. The cow with the rose and the word “micro-mooery” are endearingly silly. But the Kreider Farms design is somewhat cluttered, with illegible text on the yellow & green (!?) county fair ribbon and a crowded horizon. (Would rather have no barn and the sun a little to the right.) For me, the Peapod truck is a close second, with a lot of kelly green and some other bright colors in a crisp bold design that clearly communicates the nature of the business. But why is a nice nerd like me talking like an art critic? Hey, you are an art critic! You’ve got a good eye. Oh man that stinks you were ticketed twice. I just saw that same Peapod by Giant company truck the other day. Hi. The peapod trucks are very nice. They’re growing on me. Nice job finding beauty in unexpected places. Hello there. Thanks for visiting. And for reading my stories. You’ve set me looking for the photo of a haggis van I took in Edinburgh years ago. I hope you find the photo.